From Left: Angelique Ellis (HR Manager, IBIS Management), Jendrick Harts (UoC Student), Ir. Ergün Erkoçu (Faculty of Engineering UoC), Clark Russel (CEO, IBIS Management), Dr. Francis de Lanoy (Rector Magnificus, UoC), Amelia Vieira Rosado (UoC Student), Shaquil Maria (UoC Student), Luis Ladeira (Academic Staff Member). FOR IMMEDIATE RELEASE — September 28th, 2018. 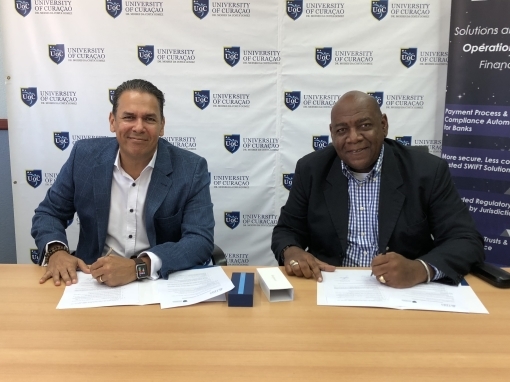 IBIS Management Associates Inc. and the University of Curaçao Dr. Moises da Costa Gomez (UoC) sign Memorandum of Understanding to collaborate on Blockchain related research, development and projects. Since May of this year, IBIS Management has been fostering local talent to work on real-world Blockchain concepts. The involvement is specifically with a group of talented students from the ICT department of the Faculty of Engineering of the UoC. The students connected with IBIS Management under guidance of UoC Academic Staff Member, Luis Ladeira, who’s passion to see these students excel and grow, has paved their way into this opportunity. While working on Blockchain ideas and applications, IBIS Management is guiding the team, which consists of in-house IBIS experts and students, to produce research papers that will help policy makers make better informed decisions and create guidelines for a digital currency infrastructure. This information is instrumental for local economic development and can function as a basis and guideline for the Central Bank of Curaçao and St. Maarten. Next to consistent in-office guidance and knowledge-sharing sessions, the students are invited to join the staff and management team in conferences and network sessions in order to gain exposure to information and professionals within the financial and business sector. These real-life experiences are valuable in shaping their future. 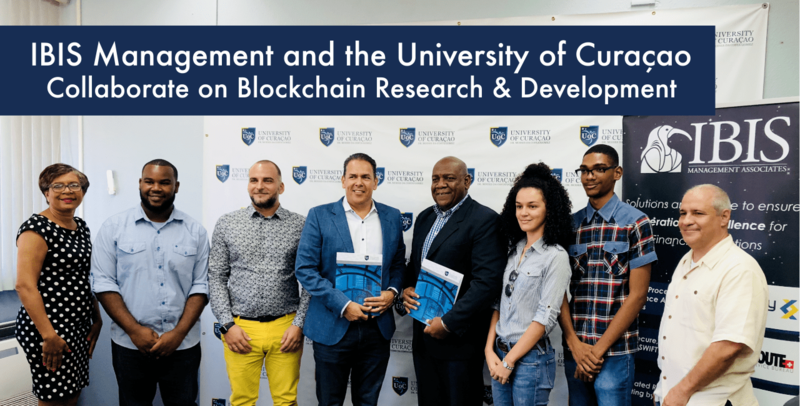 This MoU with the UoC is one of several key collaborative efforts of IBIS Management to ensure the company and the island stays ahead in terms of Blockchain development for financial institutions in the Caribbean. 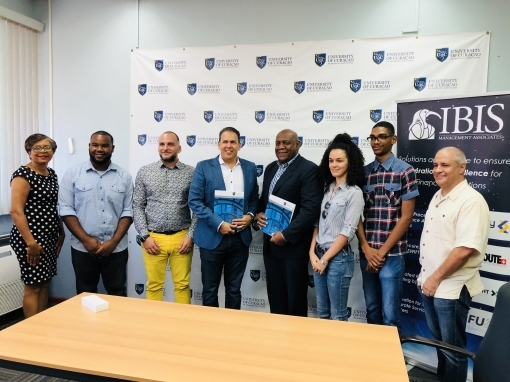 Just last week an MoU was signed with Bitt Inc., a Blockchain mobile wallet provider from Barbados, with a purpose to seamlessly connect Caribbean Banks with Bitt’ Blockchain based M-money platform, through IBIS Management’s payment automation platform, Alchemy. In simple terms, what this means is that these committed collaborations will further propel the Caribbean region into the future, making it possible to access digital wallets and use digital currencies as payment methods.